Leroy Ninker gets his own movie Writing Assignment for Leroy Ninker Saddles Up! Leroy Ninker Gets to Star in his Own Cowboy Movie writing assignment. This writing assignment is super fun. 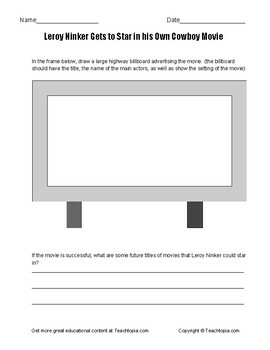 Students get to cast Leroy Ninker in his own movie, write the plot, come up with a title, and draw out an advertising billboard.